Video technology to help referees cut out clear mistakes should be introduced in English football, says referees' chief Mike Riley. Riley's comments came after referee Neil Swarbrick sent off Gareth McAuley instead of Craig Dawson during West Brom's 3-0 defeat at Manchester City. Swarbrick has apologised for the error. "We need to see what technology we can use to help get referees' decisions more accurate," said Riley. "Football as a whole has to look at it." Speaking about Swarbrick's error, Riley - head of the Professional Game Match Officials Ltd (PGMOL) - told BBC Radio 5 live's Sportsweek: "All it takes is a split-second lapse in concentration. "Neil had four or five elements to judge in half a second and it is that type of situation that would lend itself to technology." Riley said he had been to the Netherlands with PGMOL performance director Howard Webb, another former referee, to study video assistant technology used in the Dutch league. "Technology doesn't provide a solution to everything but we can all think of case where a quick reference to a video replay would help us get the decision right," he added. 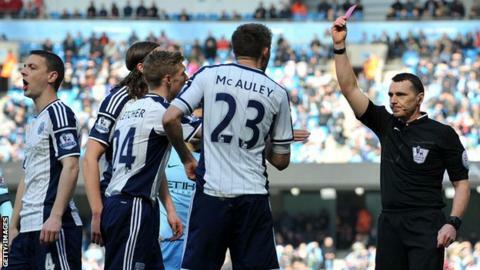 Riley also revealed that he had spoken to Swarbrick "several times" since the City-West Brom match. "All referees want to make correct decisions and when you don't do that, you feel you've let yourself and your colleagues down," he said. "We need to make sure the next time Neil referees, he has learned from the experience and will be a better referee because of it."